That brand new F-Series truck you just bought looks mighty sweet in the backyard and can pack a serious punch when it comes to towing, but even though it’s a machine built to pull thousands of pounds, using it to tow your trailer, boat, or RV can be risky if you do not take the necessary precautions, and prepare adequately. We want to point out 6 towing risks that are important to be aware of so that you can successfully avoid them. Here’s what can happen when towing goes wrong. Whether you are using an SUV or a heavy-duty truck for towing, be sure to stay in the allowed weight limit and avoid overloading. Find out how much your vehicle can tow safely if you do not want to risk damaging it, or even worse, ending up in an accident. You can look it up on the internet or in the owner’s manual that comes with the vehicle. When calculating the weight, remember to take into account the weight of the passengers as well. Prior to starting your trip, be sure to do a walk-around and thoroughly inspect your vehicle and towing equipment. To ensure maximum stability, check if your towbar is connected properly and is parallel to the ground. Towing your trailer at awkward angles can easily lead to an accident. Make sure that the tires are in good condition and properly inflated. Most importantly, check if both the vehicle’s and the trailer’s braking system are in order. Visibility can be greatly affected when pulling a huge trailer behind your truck. Modern equipment allows us to compensate for the lack of visibility by installing a rearview camera, however, if this is not an option for you, there are side mirror extensions that can help you in this department. Without good visibility changing lanes, making basic turns, or just backing up is virtually impossible. Make sure to think about that before leaving your backyard. The ability to maneuver narrow roads and low clearance passages will highly depend on the size of what you’re towing. This is why planning your trip upfront, as well as having an alternative route if something goes wrong on the main road, is super important. There are multiple ways you can do this, but the most convenient one is getting a modern navigation system that will do it for you. A good thing to know beforehand is the height of your composition, especially because of those previously mentioned low clearance passages. Before hitting the road, we suggest practicing the basic maneuvers with your trailer attached to your vehicle. This includes making turns, backing up, braking, and driving uphill. Once you got the basics down, you’ll be much more confident when you’re on the open road. Besides the basic maneuvers, you’ll want to watch your speed when moving forward and passing other people on the road. Adjust your speed according to state laws, for your own safety. When passing other vehicles, be sure to take into consideration the entire length of your composition. 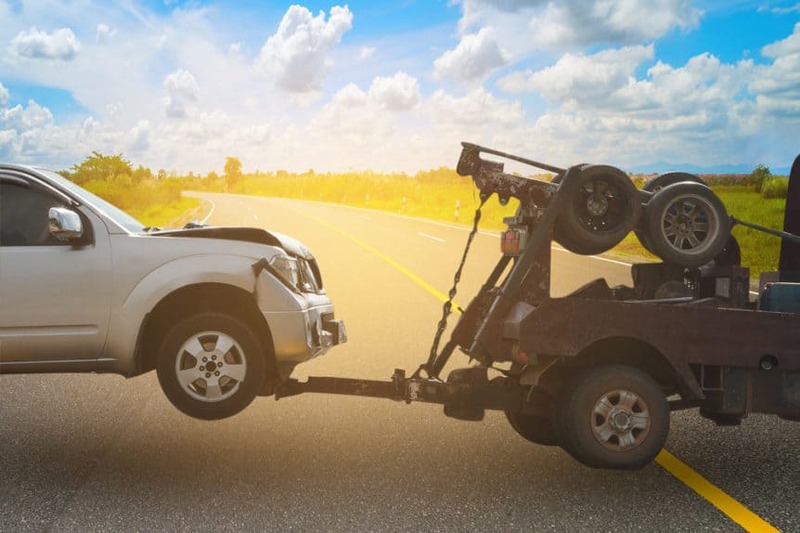 Trailer sway is when the towed trailer starts swerving side to side in a fishtailing manner and is the number one reason for all those towing gone wrong videos on the internet. It can happen for a lot of reasons including incorrect tire inflation, poor trailer design, towing at an awkward angle, strong crosswinds, excessive loads, high speeds, poor weight distribution, and many more. Luckily, most of these can be avoided by following the safety tips we provided in this article. For similar advice make sure to visit our blog. If you need any towing done in the Phoenix Metropolitan area make sure to contact us via our website, e-mail, text message, or by directly calling our office.